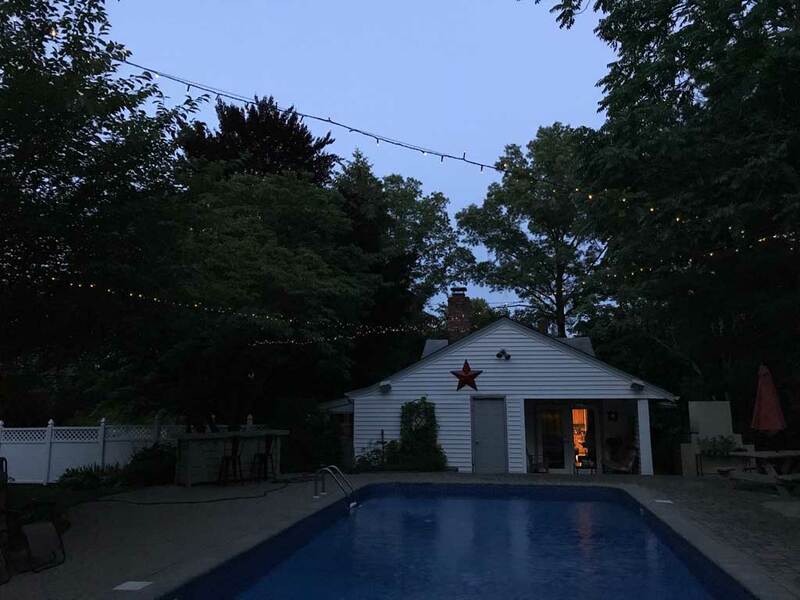 I’ve wanted string lights for a few years now and this summer I finally made that happen. 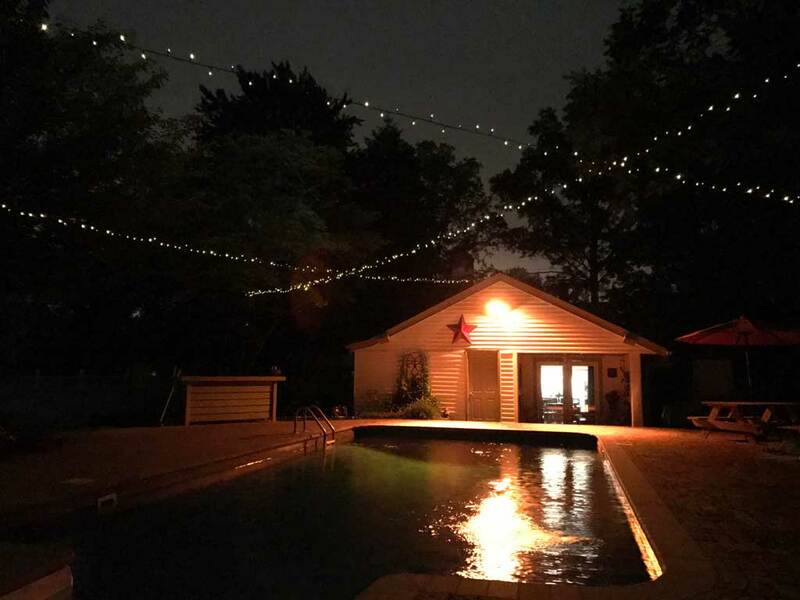 There’s something about outdoor string lights that really liven up a yard. It’s makes it feel like you’re having a party every single night. And in fact, I think my kids goal for the summer is to have a party every single night. But lets get back to the string lights. To make the set up much easier I bought solar powered outdoor string lights. No need for outlets or worrying about where to hang them. I just put these solar powered outdoor string lights where I wanted and whammy, instant party atmosphere. It’s July already and I’m usually knee deep in my yard chores at this point of the summer. But this year is a little different. We actually hired a landscaping company to mow the lawn. That saves me about 6 hours a weekend to work on other projects. The mowing the lawn part only took about an hour but the edging and using the leaf blower and picking up the leaves or other stuff that falls from the trees always took a lot of time. These are the NJ Burbs so you’ve got to have a nice looking yard. It always seemed like I was working on yard maintenance for hours and hours every weekend instead of working on cool projects. Well now these landscaping guys swarm my yard every week with their high powered jet pack blowers and standing lawn mowers. And they’re out of there is less than 20 minutes. Good for them. Anyway, one of the projects that I now had some time to work on was the string lights. We live on a little bit more than a 1/2 acre on a corner lot. It’s an odd setup because the side yard is where all the property is. That’s where the pool is and in a better distant time long ago, that’s where we spent thousands of dollars to make it beautiful. We had the pool redone and got pavers and stone walls installed. Our actual backyard is small and neglected. There’s an old concrete patio and overgrown bushes back there. But it’s shady and not a bad place to eat BBQ. I was going to put the string lights in the backyard. Another one of those projects that I haven’t had enough time to do was to build a giant picnic table about 14 feet long. Perfect spot to hang string lights over. Whoa mind blown. What a great idea! The backyard span would have only been 25 feet and I could have made three back and forth passes with the solar powered outdoor string lights that I wanted. But the pool area is much bigger. And you can’t hang something made of plastic across a span of 70 plus feet and expect it to stay up. 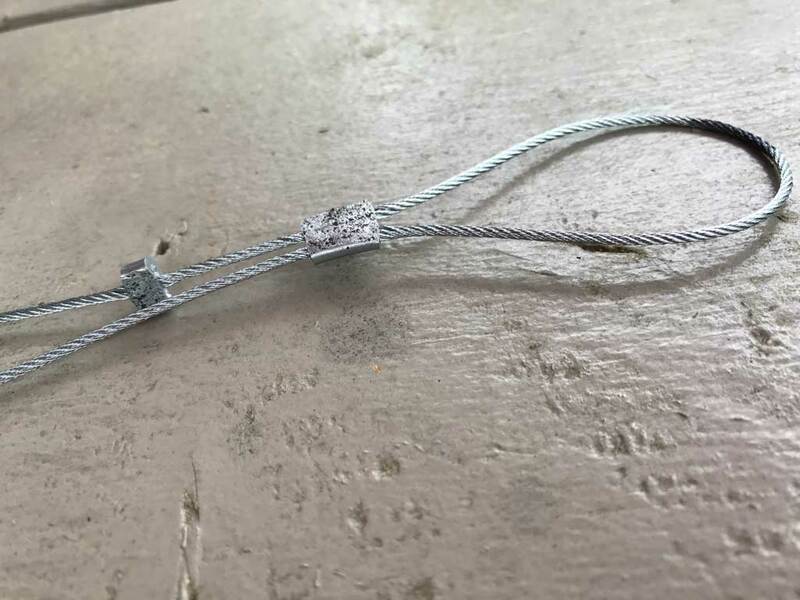 You need a metal cable to attach it to. So I finally pulled the trigger and I purchased these lights from Amazon. 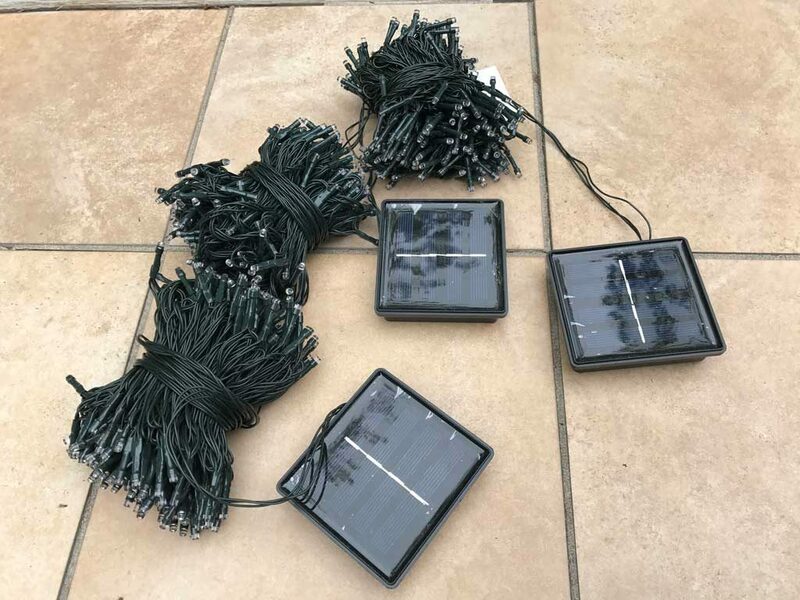 They are LED, solar powered outdoor string lights. No need to worry about putting them near an outlet or installing a new outlet. Another good thing is that they’re always on. The solar panels absorb energy from the sun during the day and when it gets dark they come on automatically. Even when we’ve had overcast days where the sun doesn’t make an appearance these light still come on for a few hours. With a sunny day the lights stay on for longer than I’m outside. And that’s good enough for me. 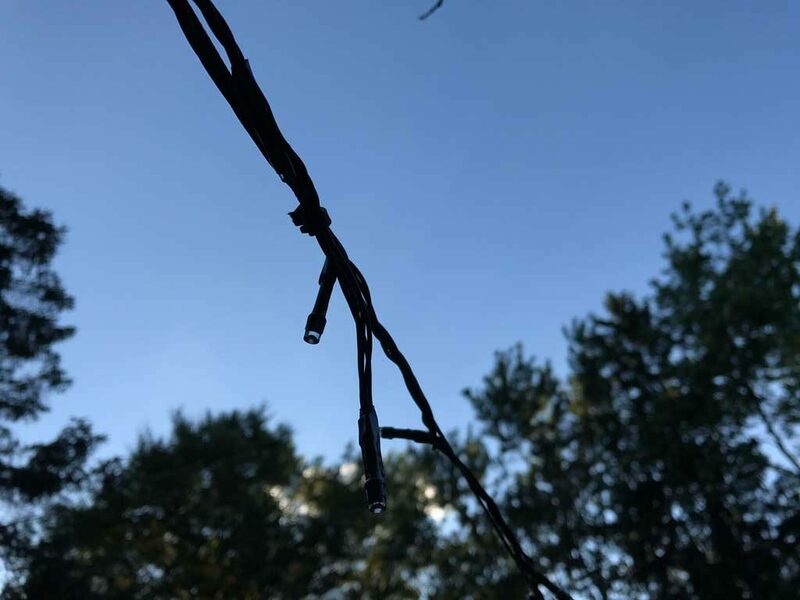 The galvanized steel cable is 1/16”. Strong enough to hold up the lights but thin enough not to need any special tools or equipment to hang. 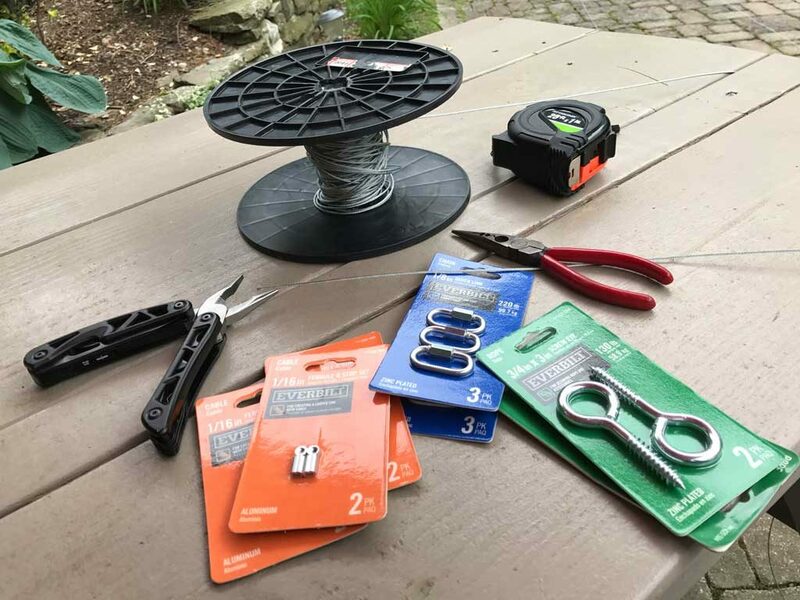 To attach the cables to a wall or tree or whatever you choose you’ll need a way to make a loop at the end. Either use with a cable clamp that you screw to the wire or with a ferrule and stop set that you crimp. These clamps cost $6 each so I opted for the $2/pair for the ferrule and stop set. A special crimping tool is used to affix them to the wire but that tool cost like $20 so I just hit them with a hammer and it did the trick. I also got some big eye hooks and screwed them into a tree, my house and I put up a 4×4 post too. I’m hanging 3 sets of lights so I needed a few different places to work with. When putting in a post you should dig down at least 2 feet and pour a bag of cement into the hole when setting the post. Let it set for a day before you start screwing into it or hanging the lights. I also painted the post black so it doesn’t attract your eye and kind of blends in. It’s also right behind a giant Diablo Nine Bark bush that’s about 8 feet tall. So it totally blends in. I have to admit that I am completely psyched that I’m finally getting some cool projects done this summer. And these solar powered outdoor string lights have really made the yard look like there’s a party going on all the time. Now if I can just convince my kids to stop inviting their friends over every night, I’ll get a change to enjoy them myself.